Orange Police Sergeant (Ret.) Michael W. Streed is “The SketchCop®.” He’s a one-of-a-kind crime fighter who’s frequently called into action by police departments seeking help solving their most difficult cases. For nearly four decades, Michael has provided signature images for the country’s most notorious murders, rapes, and kidnappings, including the kidnapping and murder of five-year-old Samantha Runnion, as well as the Baton Rouge Serial Killer. The SketchCop® has fought crime, coast-to-coast, from Los Angeles to Baltimore, Salt Lake City to Baton Rouge. Along the way, he has papered the walls of police squad rooms with sketches of their city’s most dangerous criminals. In this collection of true crime stories, Michael shares cases from his own portfolio. He describes how he connects with, and empowers, courageous victims and eyewitnesses, from all walks of life. Using their descriptions, the author creates life-like sketches of the assailants with an accuracy that has led to quick identifications and captures. 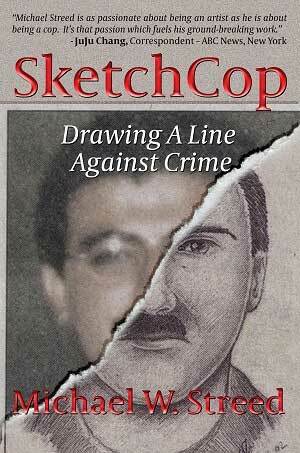 SketchCop – Drawing A Line Against Crime provides readers a glimpse at some of Michael W. Streed’s career cases and the significant role he plays in the criminal justice system. Michael Streed is as passionate about being an artist as he is about being a cop. It’s that passion that fuels his ground-breaking work. SketchCop puts the entire investigation of my daughter’s murder in a context rarely available to the public. Sarah, her friend, will be forever remembered for her unbelievable courage. The two of you clearly made a wonderful team as you worked together to make sure the man who killed Samantha could never hurt another child. Mike Streed is a cop – and one of California’s most vital artists…a standout in his field!